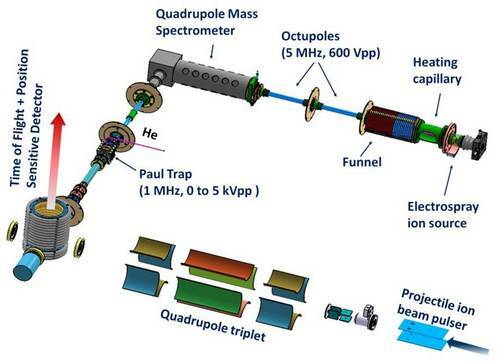 The PIBALE set-up is devoted to the study of ion-ion collisions between very low energy biomolecular species and keV atomic ions in a crossed beam configuration. The set-up has been designed for the irradiation in the gas phase of nano-hydrated biomolecules with a controlled number of H2O molecules surrounding the biomolecule of interest. The complete set-up is now installed at the ARIBE facility. The production of target and projectile beams has been characterized and compared with numerical simulations. 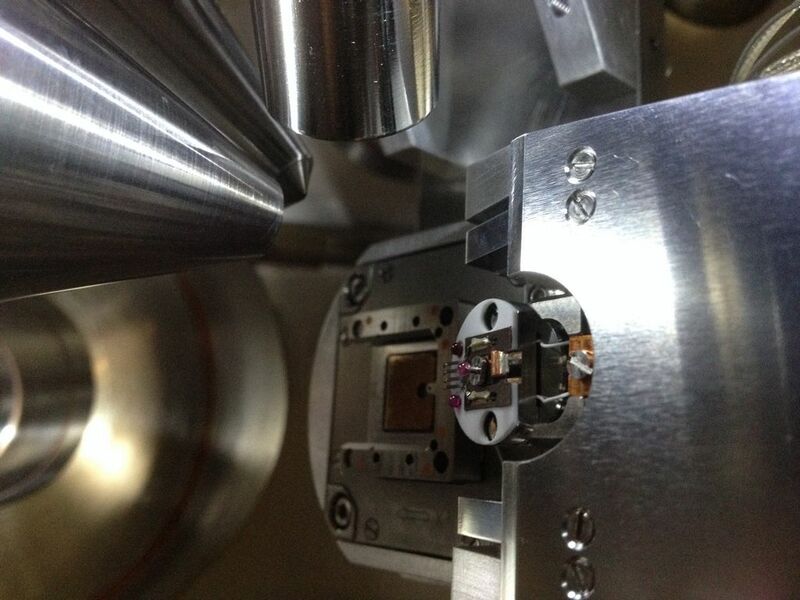 The TOF spectrometer is also fully operational. Optimization of the beams crossing is under way and first collision experiment will be performed in this year. A new collaboration with the LARIA laboratory will be dedicated to the study of cartilage proteins with applications in hadrontherapy. Financial support from the Région Basse-Normandie has been submitted in the frame of the “Projets Emergents”. In order to study the growth of large carbon containing nanoparticles, we have developed an original device which allows to manipulate under vacuum beams of nanoparticles. The project was financed by the LabEx EMC3 and realised in collaboration with Jérome Yon of the CORIA laboratory in Rouen. Soot analogues particles are produced by an aerosol generator (intense discharge with carbbon electrodes). The size distribution could be varied by different parameters (gas pressure, discharge frequency, dilution gas) and were analysed using a differential mobility spectrometer. Sizes range from several nanometers up to hundreds of nanometers. Subsequently nanoparticles are introduced in the vacuum by the aid of an aerodynamic lens which allows to focus the beam as well as to reduce the gas load (from atmosphere to 10 mbar). In the following, the nanoparticles interact with a static target (about 10 cm long) of polycyclic aromatic hydrocarbon molecules (anthracene, phenanthrene, pyrene, coronene). 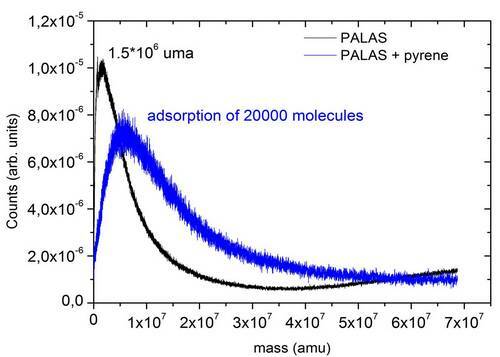 The adsorption of PAH on the carbon nanoparticles was monitored by measuring the shift of the size distribution using a time-of-flight mass spectrometer. The goal of the PELIICAEN project is to develop a platform allowing creation, modification and analysis of nano-structures and their controlled 3-D doping. 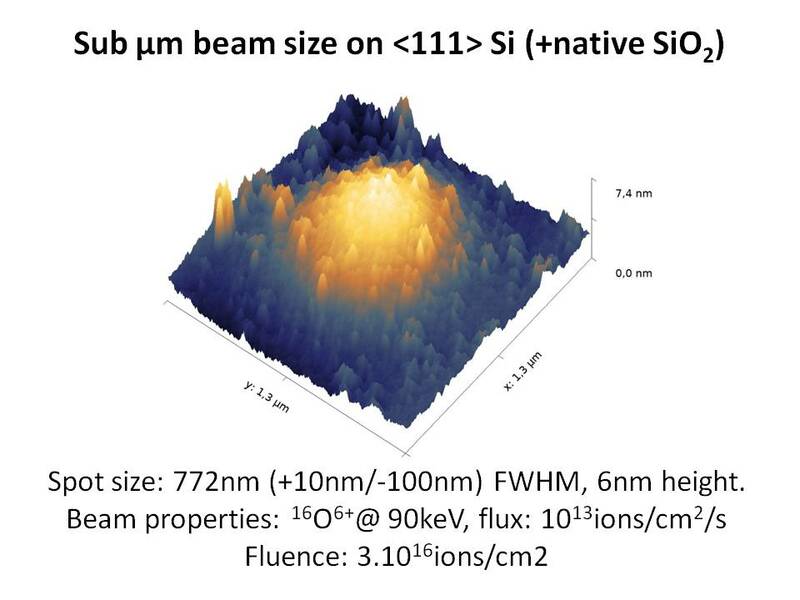 In this project a new approach, combining known technologies based on FIB and ECRIS techniques, aims to produce focused ion beams with a much larger choice of ion species and implantation techniques than currently available. This project implies the cooperation between 5 teams of the CIMAP (AMA, MADIR, LIOA, SIMUL and CIRIL), as well as the collaboration with Orsay Physics, a French SMB and one of the world leaders for the development and commercialization of FIB/FEB units and secondary emission imagery.